Super angels: recycling of old stuff? 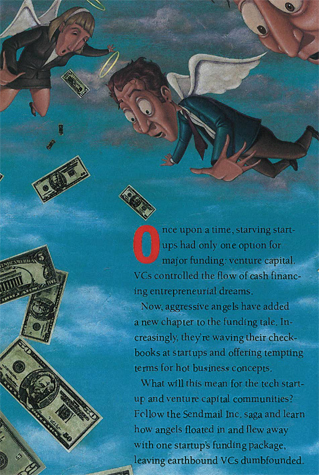 In my current reading of old Red Herring and Upside magazines (see for example Google in 2000 and Funny Data in the Internet Bubble), I just discovered an interesting ar4ticle about how angels may replace venture capitalists (Upside 1999). They take a one example sendmail which did not go with Kleiner Perkins, Accel or IVP but closed a $6M round with business angels at a $20M valuation. The article also mentions the Band of Angels, agroup of then 120 investors having invested a total of $44M with an average investment of $600k and the Angel’s Forum with 20 investors putting up to $500k per start-up. 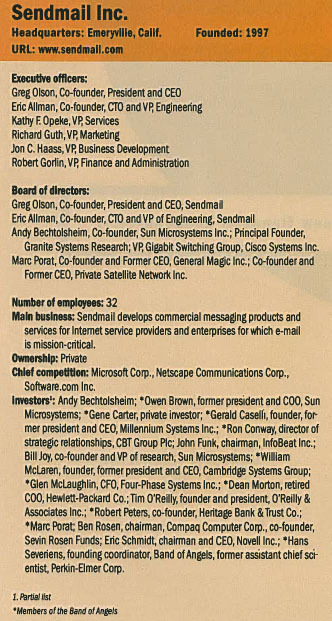 Sendmail raised $35M in 2000 (series D), $14M in 2002, as well as debt financing (at least $7M) as recently as 2009. Sendmail is still private so difficult to say if it is/will be a success or not. This entry was posted in Venture Capital and tagged Business Angels, Red Herring, Venture Capital on June 22, 2011 by Hervé Lebret.